With December 15, 2017 just passing on the calendar the new The Occupational Safety and Health Administration electronic record keeping requirements are now in effect. Most employers are already required to log and post injuries and illnesses on OSHA Injury and Illness (300) forms. Now they are also required to upload this information electronically to the OSHA website. Aren’t OSHA Violations Already Online? However, not everyone is excited about the change. Some argue this level of transparency can result in the release of proprietary information about their business, or even violate employee privacy rights. It is the view of OSHA and many safety professionals that making data more accessible will result in safer work environments because transparency will encourage employers to make safety a priority and more motivated to keep accidents and illnesses from happening. 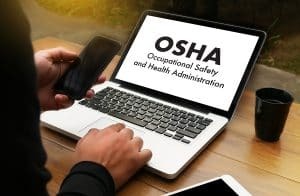 When Does The OSHA Electronic Reporting Rule Go Into Effect? The initial rule was set to go into effect in June 2017 but was delayed to December 15, 2017. Even with more time to prepare, not everyone is excited about the change – or was ready to implement in their workplace. Keep in mind not all companies will be required to submit electronic data. Employers must have more than 20 employers and fall into specified certain specific industry classes. Also, the data submitted will vary depending on the size of company. Is Your Company Ready To Implement OSHA Electronic Filing? For companies who must comply with the rule, the 2017 data must be filed by March 2, 2018. For many this seems like a large task as they are still trying to understand the rules and provide internal compliance training. Particularly, if they have not uploaded their 2016 data. If you aren’t sure how to bring your company into compliance with the new OSHA rule, Circle Safety & Health Consultants can help. We’ve helped hundreds of clients by evaluating their current systems and safety protocols, developing a plan, training and implementation. Get in touch to find out more or ask a question about the new OSHA Electronic Record Keeping rules.